Methane, the primary component of natural gas, is a dangerous greenhouse gas, accelerating global warming. Cost-effective, proven technologies are available to cap emissions from the oil and gas industry, but federal regulators have yet to take comprehensive action. Environmental advocates surveying Aliso Canyon in Los Angeles’ picturesque San Fernando Valley last month saw an ordinary natural gas facility: several tons of industrial steel poking out of the ground toward a clear, blue sky. But what could not be seen — at least to the naked eye — was a colorless cloud spewing from a leak in storage well No. 25. 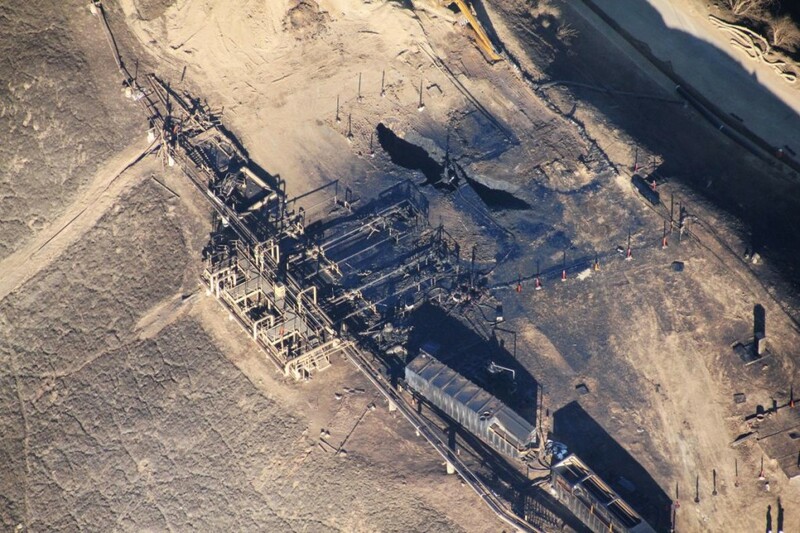 The fissure at the Southern California Gas Company site, which began in late October, had been sending an estimated 100,000 pounds of methane into the air each hour. Methane, the primary component of natural gas, is an invisible climate change “accelerant” — warming the earth at 84 times the rate of carbon dioxide over two decades. Thermal cameras have recorded the emissions at Aliso, but the climate damage done by the unprecedented leak will be harder to track — and may extend to the furthest reaches of the globe. Gov. Jerry Brown declared a state of emergency this month in response to the leak at the facility, which the company estimates won’t be sealed until late February or March. Thousands of families who live in nearby Porter Ranch have been voluntarily relocated at the company’s expense. Nearly 2,000 children have been reassigned to schools outside the affected area after kids complained of a range of symptoms, from bloody noses to difficulty breathing. Methane itself poses no long-term health risks, but a severe natural gas leak can cause short-term symptoms, including dizziness, fatigue, nausea, headache and irregular breathing. Officials believe the ailments community members are experiencing are from an odorant added to natural gas to make it detectable. While Aliso Canyon is an extreme example, experts estimate there are thousands of methane leaks across the U.S., compounding the nation’s greenhouse gas inventory and foisting political pressure onto federal regulators to deal with the global warming contributor. 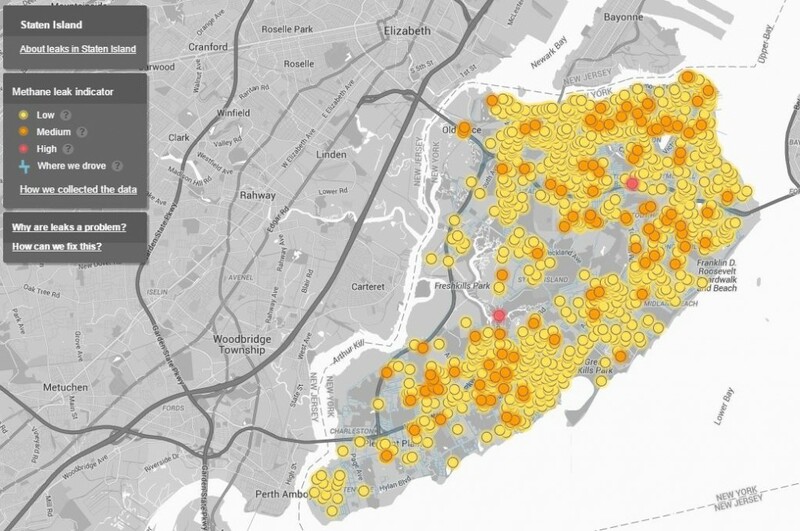 Natural gas leaks found on Staten Island, NYC. New York City has an older infrastructure that includes corrosion-prone cast iron pipes. The Environmental Defense Fund drove a team of cars outfitted with air sensors for four months in 2014 and found an average of about one natural gas leak for every mile driven in New York City’s Staten Island. In Indianapolis: one leak for every 200 miles. Chicago: one leak for every three miles. Methane seepage can occur at all stages of oil and gas production — from leaks along the more than one million miles of domestic pipeline to intentional burn-offs of the gas at the hundreds of thousands of production sites dotted across the American landscape. Hydraulic fracturing or fracking during the extraction process can leak methane too. The Aliso Canyon leak sprung from a pipe leading to a storage facility buried 8,500 feet underground. A study published in August, for example, found natural gas facilities lose about 100 billion cubic feet of natural gas each year, about eight times the estimates used by EPA. In towns across the country, methane’s invisibility makes it difficult for residents concerned about air pollution to hold industry accountable for its emissions. 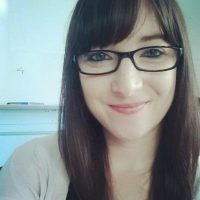 Rebecca Roter, a homeowner in Pennsylvania, said she founded a local environmental group after seeing proof of infrastructure leaks in her community on a neighbor’s infrared camera. The industry disagrees with this estimate, but unlike many issues exacerbating climate change that require complicated fixes or political buy-in from foreign actors, keeping methane from escaping into the atmosphere can be as simple as fixing a loose valve or upgrading out-of-date equipment, experts say. Cost-effective, proven technologies are available to cap methane emissions, but federal regulators have yet to take comprehensive action on this dangerous pollutant. And while some natural gas companies have joined programs to monitor and reduce leakage, advocates from the Natural Resources Defense Council (NRDC) say there is little evidence of widespread use of green technologies. For years, officials have been primarily focused on reducing carbon emissions from coal-fired power plants. On Aug. 3 of last year, President Obama announced an aggressive plan to cut carbon pollution from power plants across the country. Two weeks later, EPA detailed the first federal regulations to address methane. The agency has said greenhouse gases including carbon dioxide and methane are harmful to public health and welfare, and pose a serious threat to current and future generations. Methane contributes to the formation of smog and ground level ozone. Both are hazardous to human health. “Through our cost-effective proposed standards, we are underscoring our commitment to reducing the pollution fueling climate change and protecting public health while supporting responsible energy development, transparency and accountability,” EPA Administrator Gina McCarthy said in a statement. On Capitol Hill, the oil and gas industry has spent many millions in recent years to keep air pollution regulations — including those that might address methane — off the table at the federal and local levels, according to a PBS NewsHour review of lobbying records. Industry lobbying against methane rules has increased as government officials began to consider the issue in earnest. In 2012, Oklahoma City-based Devon Energy, along with national trade group Independent Petroleum Association of America, were some of the few players lobbying specifically against methane rules. By 2014, that number rose to at least a dozen oil and gas companies, including Anadarko, BP America, Chevron and Hess. Despite the political challenges, President Obama has pledged to cut methane emissions from oil and gas production by up to 40-45 percent from 2012 levels by 2025. While advocates have applauded the administration’s reduction goals, they point to gaps in the regulations proposed by EPA last summer. The agency has said the new rules are expected to reduce emissions by only 20 to 30 percent. The announced regulations will apply chiefly to new equipment, although existing equipment is responsible for the majority of emissions. President and chief executive officer for America’s Natural Gas Alliance Marty Durbin countered that new regulations are “unnecessary and counterproductive,” because the industry is already reducing emissions. The American Petroleum Institute agrees, citing record lows in carbon emissions. “Competitive forces and industry innovation are driving technological advances and producing clean-burning natural gas that has led carbon emissions to near 20-year lows,” said American Petroleum Institute spokesperson Sabrina Fang. Fang cites a recent EPA study that found methane emissions from hydraulically fractured natural gas wells have fallen 73 percent since 2011. The report also notes an 11 percent reduction in total methane emissions from natural gas production since 2005. These industry improvements came in ​​​part as a response​​​ to standards set in 2012 by the EPA for volatile organic compounds (VOCs) — a class of carbon-based air pollutants. The White House says even though these regulations targeted VOCs, they also reduced methane emissions substantially. This trend suggests that regulations and innovation adoption can work. What’s next for Porter Ranch? 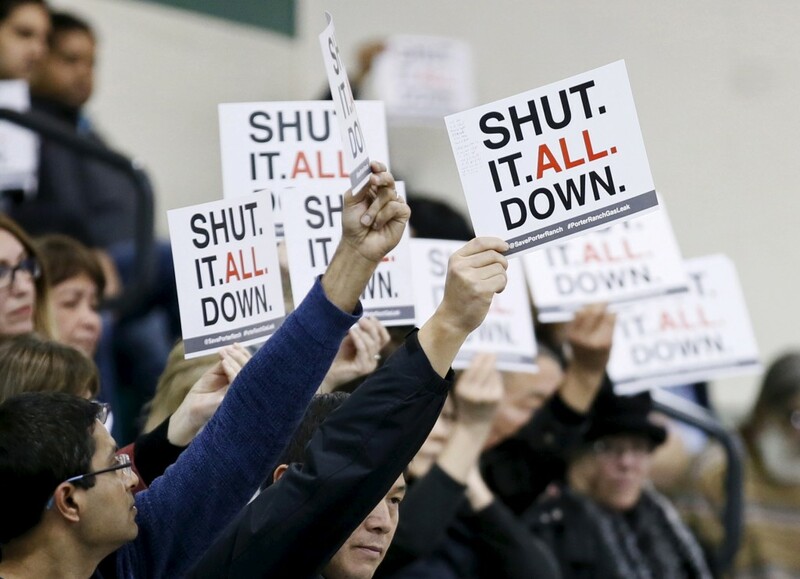 But negotiations on The Hill matter little to residents near the Aliso Canyon site who have seen their lives disrupted by the largest recorded leak of natural gas in California’s history. Matt Pakucko president and co-founder of Save Porter Ranch, an advocacy group that has long opposed the SoCal Gas facility, said he and his girlfriend have left their home at the company’s expense, but he’s not sure when or if they will return. “I want to assure the public that we intend to mitigate environmental impacts from the actual natural gas released from the leak and will work with state officials to develop a framework that will help us achieve this goal,” he said. Porter Ranch Neighborhood Council president Paula Cracium said families are relocating mostly out of fear. “You do not want to be the parent that said, ‘Ah, it’s nothing,’ and then five years later, your child comes down with cancer,” she said. Michael D. Regan, Scilla Alecci and Asthaa Chaturvedi contributed reporting.